IMPORTANT: In regards to the customer contacts you import to Retently we only act as a Processor and can share with you only the data we are processing. If there is any other Personal Data you are collecting and processing outside of Retently, you are solely responsible to providing such data to your customers (data subjects). Your customers can request to access, edit or delete their data that Retently processes, or opt out of NPS surveys and withdraw their consent by clicking on the Unsubscribe button in an NPS survey. Next, they will be redirected to the Unsubscribe page where they can choose to unsubscribe from future surveys. 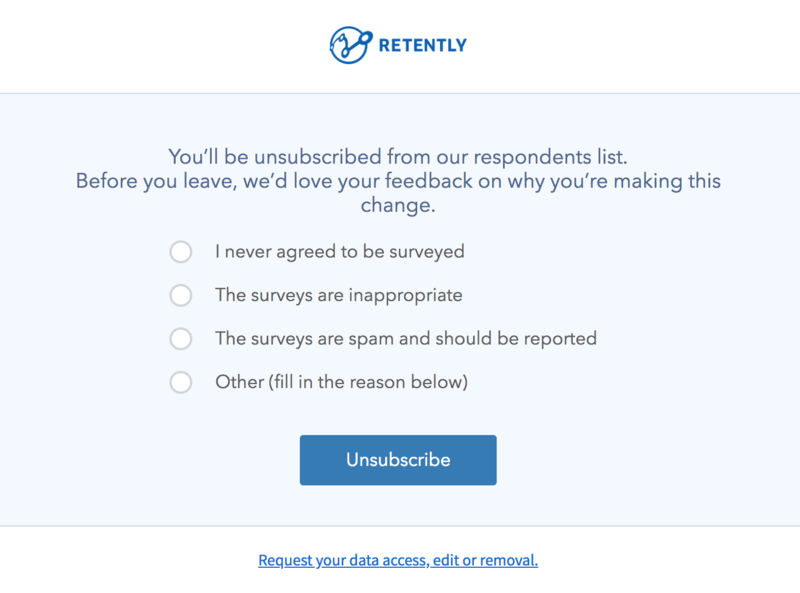 If a customer unsubscribes, this automatically opts them out of future surveys and you will not be able to contact them through Retently’s Messenger feature. 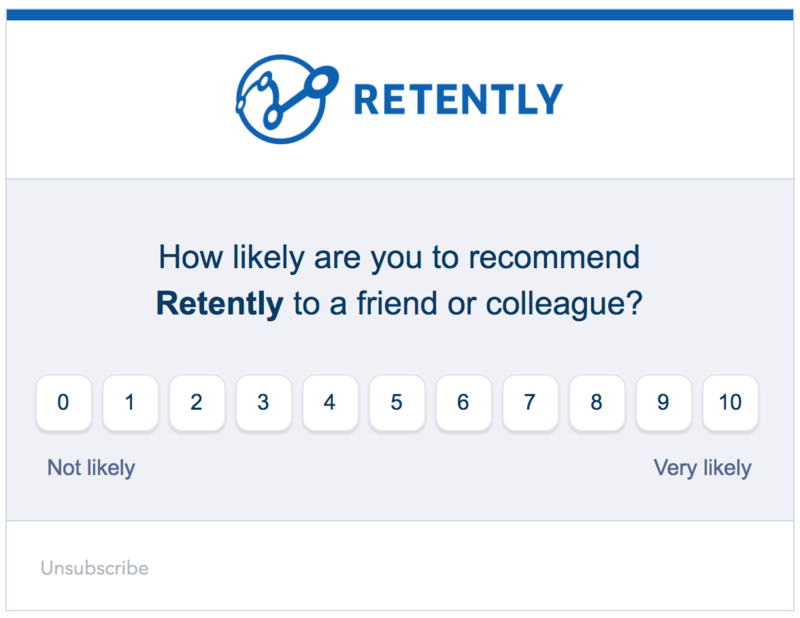 If a customer instructs you to resubscribe them to the NPS surveys, and you have their written consent, feel free to get in touch with us at support@retently.com and we will handle this request. On the Unsubscribe page the customer will also find a link enabling them to access, edit or delete their data. By clicking on the link an email notification will be sent to you, as the Admin of your Retently account, or to your Data Protection Officer (DPO), if you have one appointed in your account. If you have invited other people to join your Retently account and have assigned the Admin status to them, they will not receive the above-mentioned notification since they are not the account owners. Read our article to learn how to add your DPO in Retently. The next step will be for you to get in touch with your customers and ask for more details on their request. 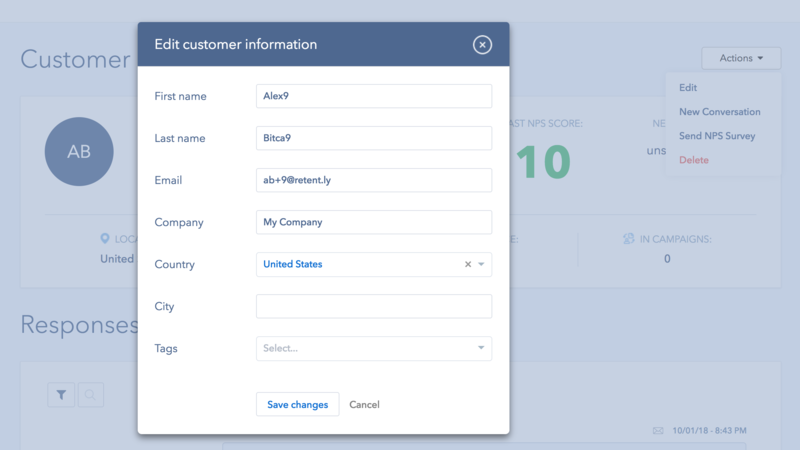 If the customer requires you to send them over the Personal Data you are processing using Retently, you can do so by going to the Customers page, write the customer’s name or email address in the search field and click on the Export filtered customers option. The customer’s Personal Data will be downloaded in a CSV or PDF format file. If required, you can also send customers all the responses they have given you. 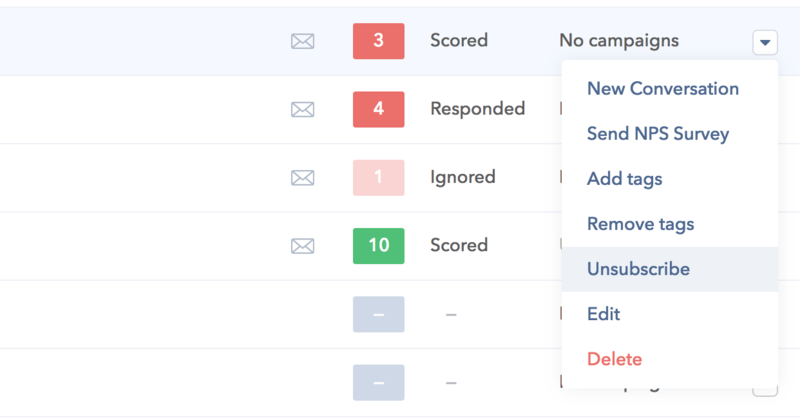 All you have to do is access the Responses page, write the customer’s email address or name in the search field and finally click on the Export filtered responses option. All the customer’s responses will be downloaded in a CSV or PDF format file. To edit customers’ Personal Data, access their profile and choose the Edit option from the Actions drop-down menu. You will be prompted a form with customers’ existing data, which you can change as requested by the customer. If a customer withdraws the consent to have their data processed by Retently, you can simply choose to unsubscribe the customer from the Customers page or from their profile page. To delete all their data altogether, choose the Delete option.